On December 26, 2014 a group of One Desk Foundation volunteers went to the Dominican Republic and built a refurbished playground which they purchased via Kids Around the World, another non profit which recycles playgrounds that have been donated by local parks. (http://www.kidsaroundtheworld.com/). Randy Gonzales is good friend of a few board members– and a cigar aficionado. He had taken a trip to the Dominican Republic (DR) a couple years back to visit the plantation where one of the world’s most famous cigars is made. The plantation is located in a very poor and dangerous part of the DR in the community of Bonao. 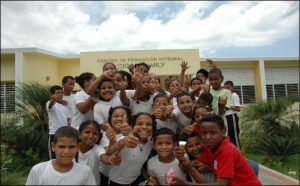 When Randy visited the plantation, he saw that the Fuente and Newman families who created his favorite cigar had also started a school to serve the children of the plantation workers, through their Cigar Charitable Family Foundation (http://www.cf-cf.org/). The school serves over 500 children from kindergarten through high school and provides the kids with schooling, two meals per day, clothes, clean water, medical/dental and social services. It takes about $1,000,000 per year in charitable donations to run this school and related facilities. When touring one of the rooms in the school there was a bed, bookshelf, books, TV, etc. – the basics. He asked why they had such a room and were told it was to teach the kids about what a home could be like, since none of these items existed in their tiny shack houses. Most of the floors where the children and their families sleep are either dirt or concrete. The one area at the school that was dramatically in despair was a playground for the kids – a couple of rusty slides and truck tires. When Randy asked Carlito Fuente Jr. about the dilapidated playground they said that they could not rationalize putting money into a playground when there were far greater needs at the school. Randy, wanting to help, turned to the One Desk Foundation and went into action. Through the efforts of One Desk Foundation and its supporters, $30,000 was raised to buy a refurbished playground from Kids Around The World and ship it to The Cigar Family Foundation to be built. The volunteers flew to the DR and spent 4 days in the hot sun working with the local community, battling mosquitos and fire ants to make their plan come to life. The days consisted of the following schedule; up early, dress with long pants and long shirts, apply lots of mosquito repellant and sunscreen, quick muffin for breakfast, bus pick up at 7:30am and arriving at the school by 8:00am. They would usually leave the plantation around 5:30pm to shower, grab dinner with the team and head to bed inside their hotel where three armed guards walked the parking lot each night. On the final day the playground was dedicated and blessed. Close to 150 children were bussed in for this special day, since the school was on holiday break. This was a big event and the children were dressed in their best outfits. Eyes were watering as each volunteer vicariously experienced the sheer joy and happiness that these children had while playing on a playground that they could never have imagined. It was a very moving experience for everyone involved.